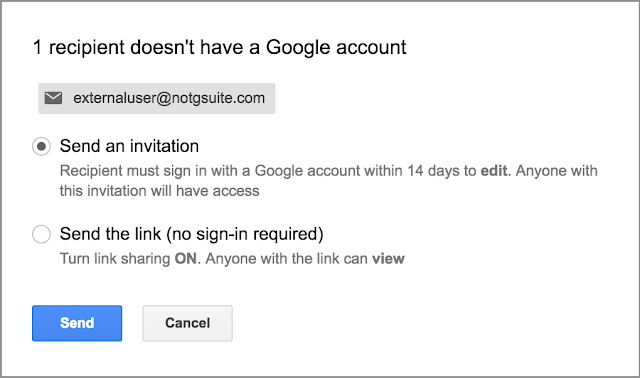 Today, if you allow users to share files outside of your domain and send sharing invitations to non-Google accounts, an employee can share a file stored in Google Drive with any non-Google user. If you allow external users to preview files, that non-Google user can view the file for 14 days. If you require Google sign-in for external users, that non-Google user is prompted to create a Google account within 14 days in order to view the file. Some third parties, however, don’t have permission to create such accounts or don’t do so in time, meaning your employee’s information doesn’t get to their intended recipient. Of course, if you also allow users to publish files on the web, your employee has another option—he or she can simply share the public link. Unfortunately, many users don’t take advantage of this option, because it’s not clearly surfaced as part of the sharing flow. To make this process easier and more effective for both G Suite and non-Google users alike, we’ll soon add an option to the sharing dialogue for users to let anyone with the link view the file. You allow users to share files outside of your domain. You allow users to send sharing invitations to non-Google accounts. You allow users to publish files on the web. You do NOT have “Recipients only” selected in your Access Checker settings. An example of the new dialogue that will appear when an employee shares a file with a non-Google account, provided the conditions above are met. If an employee selects this option to “Send the link,” link sharing will be turned on for that file and anyone with the link will be able to view the file. This will allow third parties to access important content with no deadline and no need to create a Google account. Note that the option to “Send an invitation” will remain the default selection for other files. These changes will go into effect on July 26th for domains on the Rapid Release track and two weeks later for domains on the Scheduled Release track. We know that many of your organizations work with contractors, vendors, and other third parties who don’t have Google accounts, and we recognize that it’s crucial you’re empowered to share information with them in a quick, easy, and secure way. That’s why, in response to your feedback, we’ll soon make changes to the experience users have when sharing Google files with non-Google accounts.